The Union Public Service Commission (UPSC) successfully conducted the Civil Services preliminary and main examination in the month of December 2015. A huge number of candidates applied and appeared for the examination. The results of the both the exams also declared. Candidates who had qualified in the civil services main examination are searching for the e-summon letters for the personality test/interview. The personality test/interview is scheduled from 8th March 2016. UPSC released the e-summon letters for the personality test. Candidates can download the call letters from the direct link provided below or from the official website as no paper Summon Letters will be issued for the Personality Test/Interview by the Commission. The Union Public Service Commission (UPSC) is India’s central agency authorised to conduct the Civil Services Examination, Indian Forest Service examination, Engineering Services Examination, Combined Defence Services Examination, National Defence Academy Examination, Naval Academy Examination, Combined Medical Services Examination, Special Class Railway Apprentice, Indian Economic Service/Indian Statistical Service Examination, Combined Geoscientist and Geologist Examination, and Central Armed Police Forces(Assistant Commandant) Examination. This year it has conducted the civil services main examination and the candidates who had qualified in the main exam can download the e-summon letter from the official website. 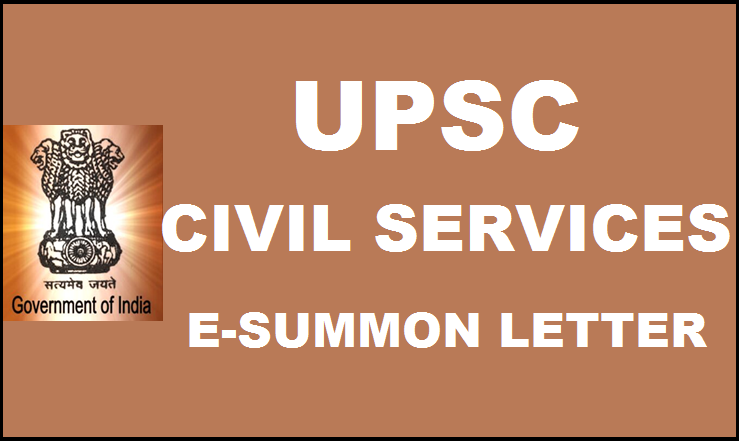 How to Download UPSC Civil Services E-Summon Letters For Personality Test? Stay tuned to this website. We will update UPSC Civil Services final merit list and latest job recruitment notifications. Press CTRL+D to bookmark this page for easy navigation.